Be the first to share your favorite memory, photo or story of Pam. This memorial page is dedicated for family, friends and future generations to celebrate the life of their loved one. Pamela DiAnn McGehee-Pongratz left this world to be with her Heavenly Father on January 17, 2019. She was born on February 14, 1964 in Amarillo. TX. Pamela is survived by her parents, Nancy McGee of Arkoma, OK and Charlie McGehee of Del City, OK; her sisters, Tami Cole of Ft. Smith Arkansas and Kandi Jeffcoat of Rogers, Arkansas; two children, Quentin Anthony Pongratz of Oklahoma City, OK and Nancy Elizabeth Pongratz of Midwest City, OK; and many beloved nieces, nephews as well as great nieces and great nephews. Pamela received Christ as her personal Lord and Savior and was baptized in Alice Springs, Australia in the early seventies. She received her LPN license at Mid-Del Technology Center while attending Del City High School. She worked as a LPN while attending school at Arkansas Tech University in Russellville, Arkansas where she received her BSN. She volunteered for Encompass until her death. She loved nursing and touched many lives in her thirty-five years of being a nurse. Pamela was a loving daughter, sister, wife, mother and friend. 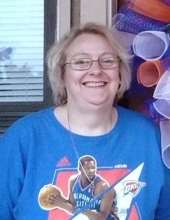 Memorial services to remember Pamela will be held on Saturday, February 9, 2019 at 10:00 am at Connect Church, 9029 E. Reno Ave., Midwest City, OK 73130. Please feel free to wear something purple in honor of Pamela. To send flowers or a remembrance gift to the family of Pam DiAnn McGehee-Pongratz, please visit our Tribute Store. "Email Address" would like to share the life celebration of Pam DiAnn McGehee-Pongratz. Click on the "link" to go to share a favorite memory or leave a condolence message for the family.